A couple of American publishers churned these out by the dozen. 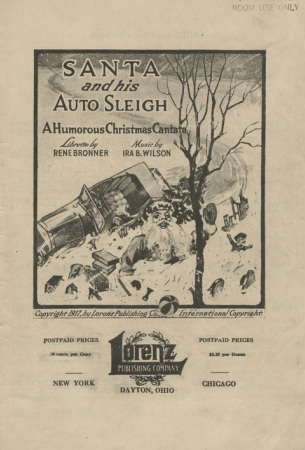 They often involved Santa's adoption of new technology - with titles like Santa and His Auto Sleigh and Santa's Airplane. Lorenz Publishing (still in operation) seemed to be particularly productive in creating these pieces. But they weren't just created by American publishers. For instance, the Waterford Town Hall saw a production of a play called "Santa Claus and Johnny Canuck" of which no trace can be found. 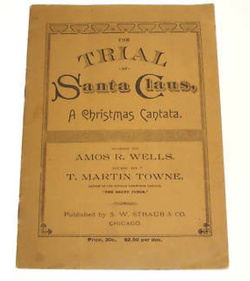 It may have been an adaptation of one called "Santa Claus and Uncle Sam"
Another thing that went along with these Cantatas was a "Christmas tree" as an event. The papers regularly said that there a Christmas Tree would be held and that the children were delighted with their gifts from the tree - this happens in the story of the Baptist Cantata below. (Think "Please have snow and mistletoe and presents on the tree"). 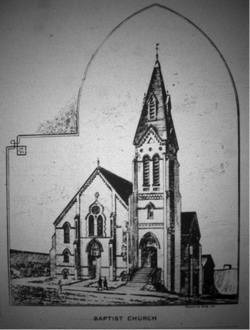 1903 was the first year that Waterford's new Town Hall was open for Christmas. 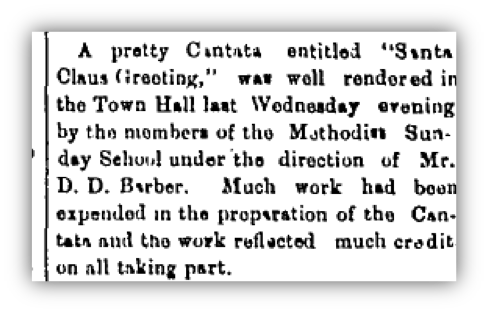 Two of the Sunday schools - the Methodists and the Baptists - undertook eager preparations to present Christmas Cantatas at the Hall. The Waterford Star promoted the upcoming concerts for weeks in advance. But questions are raised. Serious questions about journalistic integrity and bias in contemporary cantata reportage. The Methodist Sabbath School have in preparation a Cantata, entitled "Santa Claus Greeting," which they expect to give in Town Hall Christmas week. Judging from the Cantata given by this school on several previous occasions this entertainment will be among the finest. A pretty Cantata entitled "Santa Claus Greeting," was well rendered in the Town Hall last Wednesday evening by the members of the Methodist Sunday School under the direction of Mr. D.D. Barber. Much work had been expended in the preparation of the Cantata and the work reflected much credit on all taking part. of the Baptist Church Sunday School. The best Cantata ever produced in Waterford will the the "Trial of Santa Claus" Christmas eve. Great preparations are being made. 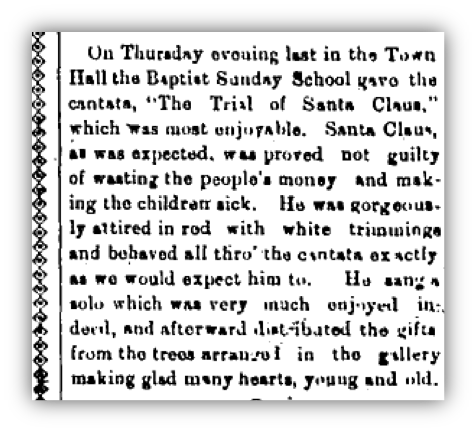 On Thursday evening last in the Town Hall the Baptist Sunday School gave the cantata, "The Trial of Santa Claus," which was most enjoyable. Santa Claus, as was expected, was proved not guilty of wasting the people's money and making the children sick. He was gorgeously attired in red with white trimmings and behaved all thro' the cantata exatly as we would expect him to. He sang a solo which was very much enjoyed indeed, and afterward distributed the gifts from the trees arranged in the gallery making glad many hearts, young and old. "Much credit" vs. "gorgeously attired"
Which cantata do you think our correspondent favoured? Which cantata did our correspondent appear to actually attend, while spurning the earnest efforts of the other???? The journalistic bias in favour of the Baptist presentation is clear. And "Why? Why?" I hear you cry. "Why did the paper so favour the Baptist cantata over the Methodist one, even before the shows went on? A clear conflict of interest was at work here. 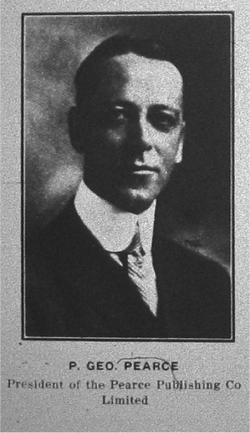 Pearce's father-in-law was the minister of the Waterford Baptist Church. Imagine yourself in the shoes of a Methodist child in the face of such bias. All your work, your practice, for weeks, reduced to the word "pretty"
by a critic who did not even deign to see your production. Perhaps another trial - not of Santa, but of journalistic integrity - would have been in order.